In a large bowl, combine ground beef, onions, garlic, parsley, egg, salt, pepper and breadcrumbs (don’t overmix or they’ll be rock-solid). Divide mixture into 8 balls. 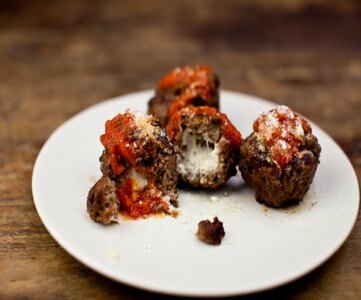 Semi-flatten each ball, add a cube of mozzarella to the center and sculpt the meat mixture around it to form a seal. Heat olive oil in a large, heavy pan and fry meatballs on each side (we know they’re balls, find sides) for 3-5 minutes, or until browned. Serve while piping hot for best cheese effect.